SteveAndDemian -- I just decided they're one of those couples who need only go by one name... Stevian? 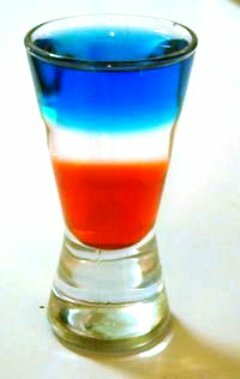 -- found a recipe for the Red, White and Blue at About.com but did not find a particular part of it easy to follow: "The key to layered shooters like this is to slowly pour the ingredients over a bar spoon in a certain order according to the density of the liquid. 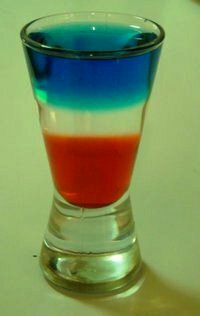 It takes a little practice but after a few tries you'll have the perfect Red, White and Blue layers inside your shot glasses." Sayeth Steven (just Steven) in response, "This did NOT work for me. With Demian's help, we learned that we had to dilute the blue curacao with a little bit of water to make it float on the Schnapps more easily. Now, the chemist in me had to make this very scientific, so the modified recipe goes something like this..."
You will also need three shot glasses, two pipets and an electronic scale. Tare one of the shot glasses on the electronic scale. Pour 1/4 ounce of grenadine into the shot glass and re-zero the scale. Pour a small amount of peach Schnapps into another one of the shot glasses. Transfer 4/10 ounce peach Schnapps to the first shot glass with the pipet to carefully float the Schnapps on the grenadine. 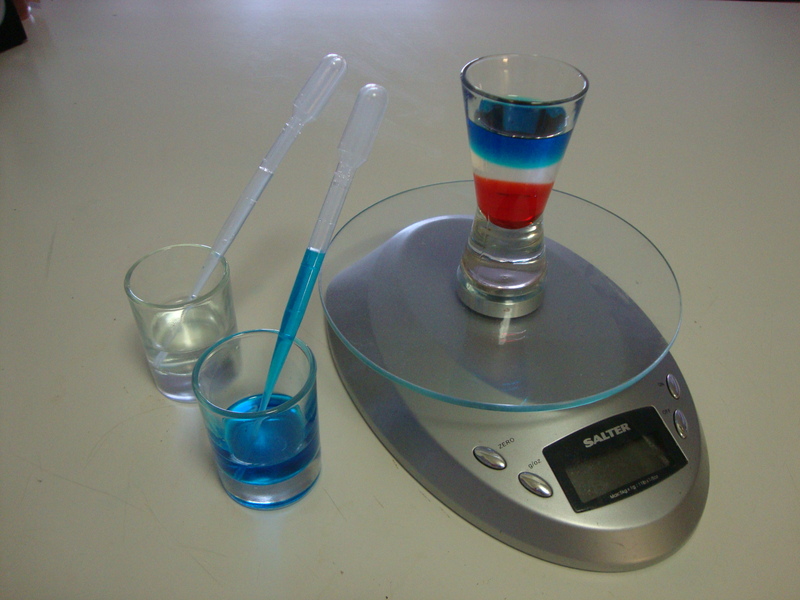 In the third shot glass, prepare a 2:1 mixture of blue curacao to water. Carefully pipet this mixture on top of the peach Schnapps layer until you have about another 3/10 to 4/10 ounce. Sayeth Steven, "The layering of the blue curacao is by far the most challenging step. Pipets are not necessary, but they make the layering much easier."